A hotelship is a passenger ship which is used for a short period as a hotel. At times when accommodation shortages can be predicted, for example during trade fairs or big events, hotelships can complement the already existing permanent hotels in a flexible fashion. In Germany, hotelships are evident during trade fair periods in Frankfurt, Cologne, Düsseldorf, Nuremberg and Hannover. The moorings are usually located near the town centre. During a large trade fair such as Drupa or Medica in Düsseldorf, up to 40 ships can be moored to accommodate visitors. River cruisers are used as hotelships for a limited time and intermittently. Whereas a hotel has a fixed address and is used permanently, hotelships are only in any one location for a defined duration. Ship owners and shipping companies are particularly keen on this use of river cruisers as, unlike in the case of deep sea cruise ships, there is no seasonal transfer of ships to warmer areas. The result is therefore more efficient use of the ships outside the main cruising season. The main thoroughfares for river cruises in Europe are the rivers Rhine, Main, Danube and Elbe. Since many cities here lie directly on the river, this is also a particularly interesting area for hotelships. Moorings are usually conveniently located in the city centre, for example at the Konrad Adenauer Ufer in Cologne, the Altstadtufer in Düsseldorf or the Holbeinsteg at the Nizzawerft in Frankfurt. These locations are all close to the city centres and the trade fair grounds. Because of this network of inland waterways, hotelships can be positioned where and when required, and usually without lengthy transfers. Hotelships are designed for cruising and therefore for longer stays on board. They are available in different categories and have between 50 and 100 cabins. Whereas earlier hotelships were very simple, they are now usually of a 4 or 5 star standard. This means the cabins come with shower, WC, air conditioning, telephone and TV. Depending on the ship, guests are likely to have bars, restaurants and lounges at their disposal, and, in superior categories of ship, even libraries, fitness areas, whirlpools or saunas. The origins of hotelships in Germany can be traced back to the 1970s. During international trade fairs it was often difficult to find good quality accommodation in a convenient location because of shortages of hotel rooms. During the International Textile Trade Fair in Frankfurt, the idea was born to moor a river cruiser on the banks of the Main and thus increase bed capacity in the city centre. Even today, the Frankfurt am Main harbour authorities offer moorings for hotelships on the Nizza Werft. During the last 10 years, river cruises in Europe have become a growth area of the tourism industry. 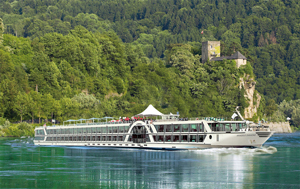 Since the completion of the Rhine-Main-Danube Canal, the fall of the Iron Curtain and the expansion of the EU, there has been a huge increase in the potential for river cruising as part of the cruising industry. River cruising has become more comfortable and so has increased in popularity, allowing it to compete with European coach tours. As a result, there has been a steady increase in the number of ships available in recent years and therefore the availability of cruise ships for use as hotelships has also increased. Another reason for the increased use of hotelships is the huge peak in demand for hotel rooms in trade fair cities. Local hotels demanding heavily increased prices during trade fair events has recently led to cutbacks in trade fairs or even their complete withdrawal. Many visitors have stayed away or just come for the day and have been able to do so because of reduced transport costs with budget airlines or ICE train connections. Hotelships redress the balance during these temporary peaks and, in spite of criticism from local hotels, help make trade fair locations more attractive and more competitive. Hotelships operate as a balance in the hotel market where the market is too inflexible to react to periods of high demand such as is the case during trade fairs. Additional capacity through the construction of new hotels is not always possible and indeed not always desirable since in times of low demand outside the trade fair season, this creates excess capacity. The introduction of hotelships takes account of this situation and helps to balance occasional high demand with supply. Hotelships are usually marketed by charter agencies who make use of accommodation made available by shipping companies such as Viking River Cruises from Luxembourg, or private independent shipping companies. Market leaders in Germany are Crossgates and Regis Hotelschiff GmbH. Their role is to charter ships and position them in the relevant cities whilst at the same time ensuring and maintaining agreed standards. The charterers keep in close contact with trade fair organisations and tourist offices in the relevant cities in order to provide hotelships as and when required. Hotelships are therefore seen as a way of accommodating more trade fair visitors in the city, rather than in outlying areas. Guests include individual clients as well as companies who usually book their hotel accommodation via specialist travel agencies or directly with the local tourist office. During the 6-month season in 2008, hotelships in Germany boosted the market with an extra 100,000 beds and their turnover was about 10,000,000 Euros. This only represents a small part of the total hotel capacity in Germany. Berlin alone, for example, has a daily capacity of 97,441 beds (figures from December 2008). ^ Rheinische Post Archived 2009-04-30 at the Wayback Machine Daily Germany Newspaper, published in Düsseldorf, the state capital of North Rhine-Westphalia, The Article “Volles Haus in Düsseldorf”, May 26th, 2008 (Full House in Düsseldorf) describes the hotel situation and the need of hotelships during the major trade fairs in Germany. ^ Hafen Frankfurt Archived 2010-01-21 at the Wayback Machine The Frankfurt Harbour management company (FHM) | Hotelships in Frankfurt, The FHM describes hotelships as a central part of Frankfurt’s hotel industry during the major trade fairs. ^ Hafen Frankfurt Archived 2010-01-21 at the Wayback Machine The Frankfurt Harbour management company (FHM) promotes hotelship accommodation as an attractive option during trade fairs in Frankfurt. ^ Rheinische Post Archived 2009-04-30 at the Wayback Machine Daily Germany Newspaper, published in Düsseldorf, the state capital of North Rhine-Westphalia, The Article “Volles Haus in Düsseldorf” (Full House in Düsseldorf) describes the hotel situation and the need of hotelships during the major trade fairs in Germany. ^ British Plastics Federation The British Plastic Federation advises its members about the option of booking hotelship accommodation for K2010 in Düsseldorf. ^ Düsseldorf Marketing und Tourismus GmbH Hotelship accommodation in Düsseldorf is also bookable over the Düsseldorf City and Tourism Marketing association(DMT). ^ Tourismus und Kongress GmbH Frankfurt am Main The Frankfurt Tourism Association promotes a booking service for hotelship accommodation furing trade fairs in Frankfurt. ^ Crossgates British hotel ship agency, Key facts on the hotelship industry in Germany. ^ Berlin Tourismus Berlin Tourism Association, Statistics on the hotel situation in Berlin 2008.